In a season of Thanksgiving, Patricia Eastwood stops in at Bacon to introduce us to a remarkable book about friendship. I know that tradition dictates New Year’s as the perfect time to declare a resolution or create a goal, but I have always found myself taking on the challenge of “new plan/new efforts” right around the start of the academic school year. I suppose it’s the buying of school supplies, a new planner for the family and reconnecting with other moms that makes me yearn to marry up my love of schedules and calendars with goals and self-improvement. This off-schedule resolution-making has the added benefit of improving my holidays, because I am well off my “eating better” goal by November and can simply enjoy myself. 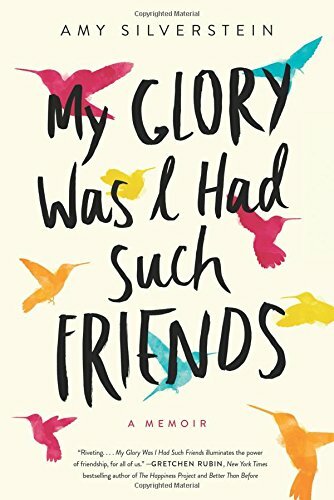 This year (2017-18 academic year), I happened to be reading My Glory Was I Had Such Friends by Amy Silverstein, and I stopped in my tracks and took a minute to seriously – I mean seriously – self-reflect on friendship. It was a bit scary to do that, because I often feel guilty about not having more of “me” to spread around and capacity for being social. When I am feeling my limitations, my friends probably have drawn the short end of that stick 95% of the time. The insights I gained reading My Glory helped me feel less guilty about having only so much to give during different seasons of my life. More importantly, the book also inspired me to set some personal goals around friendships that, so far, are not abandoned, even with the holidays well on the way. I love a memoir that is not just a telling – rather, it has something to teach. Silverstein’s extreme crisis provides a dramatic basis for this type of reader-experience. Amy Silverstein also wrote a best-selling, earlier memoir called Sick Girl about her receipt of a donor heart while she was in her twenties. While I have not read it (yet), it is by her own account a love story, as she meets and falls in love with her husband Scott during that ordeal. In My Glory, Silverstein tells the story of discovering her donor heart has started to fail after twenty-six years of service (mysteriously, at the same time she sends her only child to college) and her journey to seek a new heart. While we know how the story ends, because she wrote the book, Silverstein is masterful at keeping the backstory of the transplant suspenseful and interesting. I call the transplant “the backstory” because My Glory is a celebration of the friends who rally around Silverstein during her health crisis, rather than a medical tell-all or a tale of triumph over suffering. The story opens with Silverstein and her husband pragmatically deciding to move from New York City to California in order to optimize her chances of receiving a new heart and having a successful transplant. Upon this announcement, one of Silverstein’s friends decides that she can help Silverstein best by providing her in person care for a week at a time, on a periodic, scheduled basis. She gathers names of other women friends of Silverstein and begins to coordinate them into a caregiving schedule that is logistically amazing and jaw dropping as an open-ended, this might-not-end-well commitment. The result is a rotating group of supporters that enable Scott to continue working and largely prevent Silverstein from having to hire a large staff of caregivers. The members of the group did not know each other as a collective, but, rather are connected by Silverstein and her crisis. The friends rotate in and out of Silverstein’s home confinement and hospitalization and talk with Silverstein during the many hours of waiting for a heart. The book weaves together Silverstein’s impressions, taken from the numerous hours of hospital discussions and gestures of goodwill from each of the women, about why each friend decided to participate and the surprising impacts the commitment had on each of their lives and Silverstein’s. The insights are rich and Silverstein provides the reader enough facts for personal analysis and reflection. It is from this author-provided opportunity that I was motivated to step back and think about my own view of friendship and the approach I’d like to take with my friendships going forward.